Should You Break Up With Your Phone? Does that question cause you some anxiety? Even thinking about it may feel impossible! Our phones are used for so much these days; banking, shopping, entertainment, keeping in touch, navigating and more. Even my kids share ways their teachers incorporate their phones into their school day with quizzes and classroom research. As our use of our phones has grown, so has the research suggesting that our phones can impact our health: physically, mentally and emotionally. With this in mind, taking a break from your phone can be a powerful way to improve your health and well-being. The benefits of taking a break from screens are vast and impact many areas of our daily life. Improved mood, better sleep, a healthier work/life balance, being more present in everyday moments and even a more focused driver are all positive benefits from a break. Remove phones for transitional moments in your day: walking, getting ready in the morning, driving etc. Instead of allowing your phone to distract you focus on walking from your car into the grocery store. Be present in the moment. Pay attention to your breathing, what you see, what you smell. Consider other ways to fill down time: We haven’t always had our phones. What did you do with your downtime before? Our phones often control or take over our downtime with checking on social media or playing a game. Think about what you used that downtime for before you started crushing all that candy and try to implement some of those activities or hobbies. Put your phone away before bed: The blue light emitted from our phones can impact sleep, making it harder to fall asleep or stay asleep. Our mind needs time to unwind after technology use throughout the day. Shutting off your phone 30 minutes before bed can help you achieve more restful sleep and help your brain produce the melatonin it needs to fall asleep and stay asleep. Find opportunities to explore the real world: Get outside, spend some time in nature. Focus on building real relationships. Walk over and have a conversation with a neighbor face to face instead of texting. Call a friend or make plans that don’t include screens or your phone. Put your phone away during conversations: Studies show that people feel less connected to conversation partners, and found their partners less empathically attuned, when a cell phone was present during the conversation. Having a phone present can be a barrier to a deeper or meaningful conversation. These conversations require trust and undivided attention. Putting your phone away shows your loved ones that you are listening and focused on them. Whether as a temporary breather or an opportunity to create enduring change, there is much to be gained from taking a break from your phone. Screen-Free Week is April 29- May 5. Take the online pledge and you’ll receive support and tips for going screen free. There is no need to go it alone- consider getting close friends, family, and household members to join you in this effort. Get Unplugged. Get into Nature. 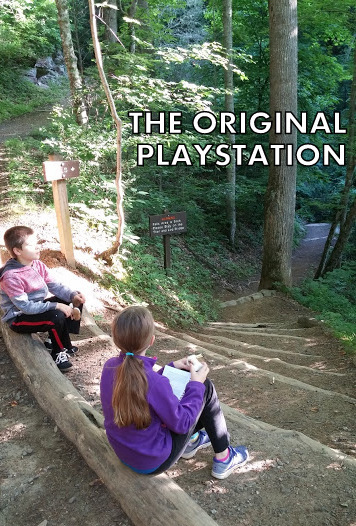 The term Nature Deficit Disorder was coined by author Richard Louv in his book “Last Child in the Woods” to describe the phenomena of children and youth becoming disconnected from nature. Adults can certainly suffer from nature deficit disorder, but chances are, most adults spent more time outside as children than our kids do today. Research is linking nature deficit with some disturbing child outcomes, such as increases in obesity, attention disorders and depression as well as diminished use of one’s senses. Some of the reasons for this disconnect with nature in recent decades include urbanization and disappearing green spaces, spending more time indoors, and increased use of technology and electronic communications. These trends contribute to a devaluing of independent play and what health experts are calling the “epidemic of inactivity.” The time kids spend outdoors is increasingly spent in structured play or organized sports, instead of ‘playing in nature.’ Unstructured play in nature allows for developing problem-solving, creativity and emotional development, according Dr. Stephen Kellert of Yale University. In his book “Building for Life: Designing and Understanding Human-Nature Connection,” Kellert urges community leaders and urban designers to consider green space and creating opportunities for children to have positive interactions with nature on a daily basis. Nature is everywhere. You can find nature by planting seeds in a pot on the front porch or sketching a tree as well as by venturing into a wild preserve. Be prepared. In order to get the most from your time outdoors, bring along snacks, water, sunscreen, and even a change of clothes in case your kids get wet or cold. Embrace the elements. Dress for the weather, stomp in a puddle, enjoy a rainy or snowy walk in the park. Model curiosity. If you see plants or animals or holes or nests you can’t identify, show your curiosity. Kids have a natural sense of wonder and this can lead to some awesome discoveries. You can look things up together when you get home. Bring friends. Your family can bond in the company of other families; in fact, you might have even more fun! Create stories. At the end of the day, have each family member talk about their favorite part of the time spent outdoors. These will become part of your family lore. You can revisit those places and support the wonderful connections you’ve built together outdoors in nature. Make it a goal to spend an hour outside each week, connecting with nature and with others. See this PBS article for more ideas on how to help your kids get plugged into nature. You can also check out your local parks for nature education programs. Richard Louv offers a Resource Guide full of ideas for connecting with nature. Get outside. Get connected. Get into nature. Kellert, Stephen R. Building for Life: Designing and Understanding the Human-Nature Connection. Island Press, Washington. 2005. Louv, Richard. Last Child in the Woods: Saving Our Children from Nature-Deficit Disorder Algonquin Books, 2005.